Griffin Internet Syndicate Classic — Reading Ronald Reagan's newly published letters reminds me how much I've always liked him, even after I stopped admiring him as a president. He was always a modest, decent, good-humored man, with more common sense and a keener sense of proportion than most politicians. And he loved a good laugh. But the very qualities that made him charming and convivial underscored the absurdity of entrusting him, or any man, with the awful power of the American presidency. The superlatives his adulators heap on him seem as wide of the mark as the exaggerations of his detractors: he was really quite an ordinary man, and he never pretended to be anything else. He should never have had all that power, but who should? At least it should be in the hands of a man who didn't take himself too seriously and wouldn't abuse it as grossly as most. He only shocked me once. That was in 1983, shortly after the grisly bombing of the U.S. Marine barracks in Lebanon, when he ordered the retaliatory shelling of a village that was said to be a terrorist stronghold. Such an act was bound to kill indiscriminately. It was murder! And the Ronald Reagan I knew wasn't a murderer! This couldn't be happening! But it did happen, and everyone seemed to take it for granted that a president had to "strike back" at terrorism, however wildly, in order to display American "resolve." It wasn't murder; it was part of the job description. 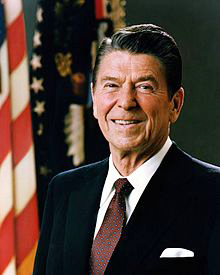 I was one of his true believers — one of those who cried, "Let Reagan be Reagan!" in the conviction that those weaselly moderate Republican advisors, those disdained "men around the president," were holding him back from acting like the true conservative he was at heart. I'd first paid attention to Reagan when I was in high school and I heard a recorded speech he'd given, as a spokesman for General Electric, contrasting American free enterprise with Communism. I thought he was terrific. I was delighted a few years later when he went into politics and got elected governor of California. By the time he ran for president in 1980 I had high hopes for him. I thought he would lead a repeal of all of liberalism's gains since the New Deal. I didn't stop to reflect that I was thinking like a liberal myself — hoping for a president who would be a messianic leader, a charismatic one-man show. Well, there have been worse political messiahs. Whatever else he did, Reagan never lost his modest charm. I heard him speak at a few conservative gatherings, and he never failed to bring down the house with a great joke. As a British writer recently observed, Bob Hope couldn't hold a candle to Reagan as a raconteur. He really brought fun to the White House. I was never prouder than when I heard he'd roared at some of my own jokes. I was bound to be disappointed by his compromises. In time I was so disillusioned with him that I actually made a joke at his expense: "Let someone else be Reagan." But that wasn't until his second term. Many principled conservatives saw through Reagan long before I did — if I ever did. He had a way of convincing sentimentalists like me that he shared our passions, despite any appearances to the contrary. I was a sucker for him, and maybe I still am. I think I know better now, but I'm not entirely sure. Strange, the way some men can make you want to believe in them. Whatever that quality is, Reagan had it. At one time, about half my friends were Reagan speechwriters, and every one of them worshipped him. They're still writing loving books about him. That was my generation. We'll never feel that way about another politician. Maybe you can be pardoned for getting carried away like that once in your life, but in any case it can't happen twice. If you're really wise, it won't even happen to you once. The U.S. Constitution defines the president's duties very narrowly, and they don't include running the economy, bombing villages, or even telling great jokes. Reagan wasn't a great president. "Great" presidents, as usually conceived, are unconstitutional. I like to think Reagan understood this. At least I'm pretty sure he was the last president who even glanced at the Constitution once in a while. Copyright © 2018 by the Fitzgerald Griffin Foundation. All rights reserved.